These Fudgy Samoa Girl Scout Vegan Brownies with Coconut Caramel are the perfect brownies that can be made gluten free for Passover, Easter, Mother’s Day and more! Spring is finally here and not only does that mean better weather, but also some of my favourite holidays are all around the bend – Passover, Easter and (MY NEW FAVE), Mother’s Day. Basically, all great reasons to eat chocolate. 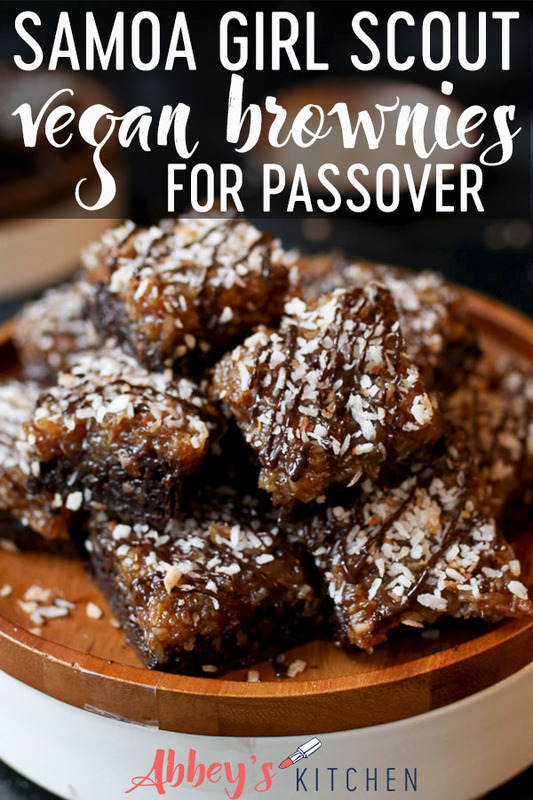 This recipe for Samoa Girl Scout Vegan Brownies was actually inspired by my Passover menu because I knew I had to come up with a recipe that would be gluten free or without grains other than Matzo, and also dairy free since we always have a meat-based seder. At Passover, coconut macaroons are often a staple, so I wanted to kind of play with that flavour profile and make it…well.. better. No offence to macaroon lovers, but they’re dry and boring in my books. If I’m going to eat dessert, I want to make it AMAZING. Well let me tell you, folks. 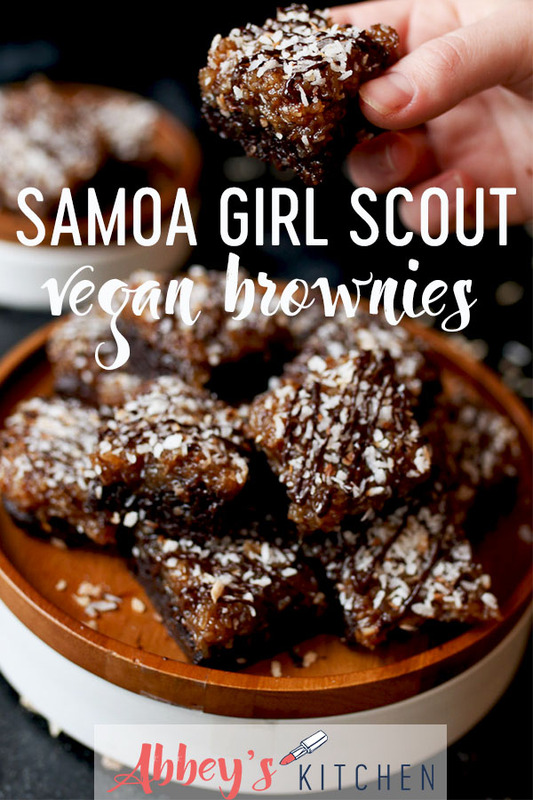 These super FUDGY Samoa Girl Scout Vegan Brownies are freaking…amazing. They can be made gluten free or Kosher for Passover, vegan, or not. Either way, they’re insanely good. I admittedly ate like 5 of them in the course of two days, and I don’t usually even love chocolate desserts. THEY’RE THAT GOOD. What the heck is a Samoa? I actually have no freaking clue, but if you’ve ever been a girl scout, you know the iconic cookies well. Caramel, coconut and chocolate meet in this EPIC (charitable) treat. It really is such an awesome combination I can’t help but let it inspire other desserts. I used this as inspiration in my book, the Mindful Glow cookbook, to make the most amazing gluten free donuts (you need that recipe NOW), and these brownies are equally divine. The key to making the most FUDGY brownies of LIFE is that there’s very little starch in there. It’s mainly just chocolate! I also use a chia egg which actually keeps things surprisingly moist, dense and not fluffy. 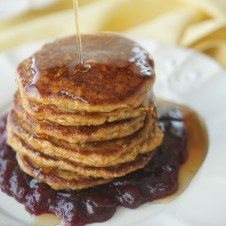 If you’re not keeping Kosher for Passover, then flax egg works too, and if you aren’t doing vegan, you can use an egg yolk. I then make a caramel out of beautiful dates (a staple in Israel), and I mix that with lots of coconut. Honestly, the coconut caramel is DEADLY. You really only need super small pieces of these Samoa Girl Scout Vegan Brownies because they’re so fudgy and rich. Honestly, you may need to store these in the freezer to prevent eating them all in one shot (like I did). But that’s also an awesome thing for entertaining. They can be made ahead, frozen and then thawed out and served. I recommend making sure you let them come completely to room temperature, however, since the chocolate will harden and they will lose their fudge factor if they’re served cold. 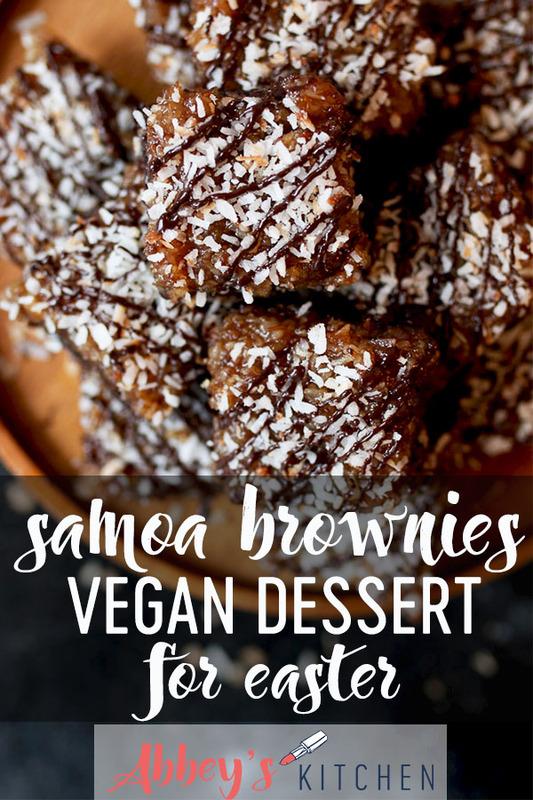 Now loves, let me know – have you tried these FUDGY samoa girl guide vegan brownie? Preheat oven to 350°F. Line an 8×8″ baking dish with 2 overlapping pieces of parchment, leaving overhang like wings. In a bowl, mix the cornstarch, cocoa powder and salt. Melt the chocolate and coconut oil for 30 seconds in the microwave on 50% heat until fully melted. 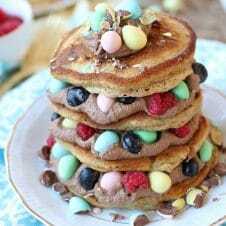 Mix in the chia eggs, brown sugar and vanilla, then add the wet ingredients to the cornstarch and cocoa. Transfer to the prepared pan and bake for 25 minutes or until a toothpick inserted into the centre comes out with just a few moist crumbs. Allow to cool. Meanwhile, heat the dates and coconut milk in a small sauce pot over medium heat. Cook for 4 minutes or until the dates soften, then transfer to a food processor or blender. Puree until smooth. Add the maple and salt and puree again until incorporated. Transfer back to the sauce pot and cook over medium low heat for 4 minutes until bubbling and thick. Add all but 2 tbsp of the toasted coconut to the date caramel and spread on top of the baked brownies. Top with the remaining toasted coconut. Place in the freezer to set up for an hour. Before serving cut into 16 bars. Melt the remaining ½ oz of chocolate for 30 seconds in the microwave on 50% heat until fully melted. Transfer to a piping bag and drizzle the brownies. *Note – if you’re gluten free and keeping Kosher for Passover, you can grind gluten free matzo in the food processor to a very fine powder if you cannot find gluten free matzo cake flour. Wow these brownies look incredible. I love that caramel topping. This looks so good I have to make it this weekend. 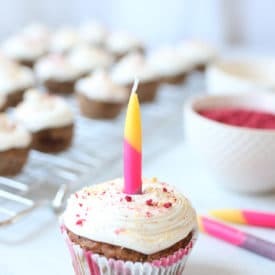 What can I use instead cornstarch? Potato starch or tapioca starch works! These look absolutely amazing! Samoas are always my favorite, and I love the idea of mixing them into a brownie recipe! Yum! If it has fudgy in the name, you have my attention. These looks absolutely delicious! Stop it! These look incredible! I can’t believe they’re gluten free and safe for Passover. Pinning! Fantastic! I am still looking for some Passover dessert ideas. This is great!